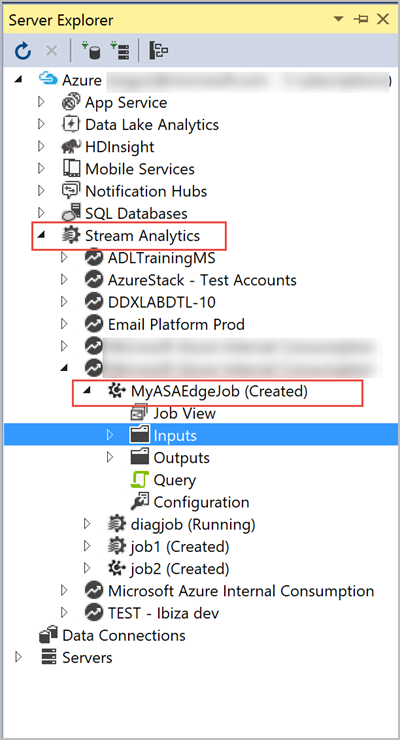 In this tutorial, you learn how to use Stream Analytics tools for Visual Studio to author, debug, and create your Stream Analytics Edge jobs. After you create and test the job, you can go to the Azure portal to deploy it to your devices. Install Visual Studio 2017, Visual Studio 2015, or Visual Studio 2013 Update 4. Enterprise (Ultimate/Premium), Professional, and Community editions are supported. Express edition isn't supported. 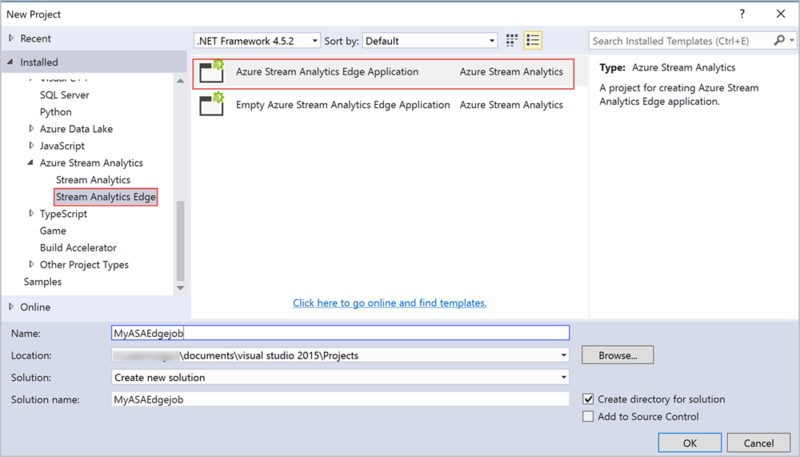 Follow the installation instructions to install Stream Analytics tools for Visual Studio. From Visual Studio, select File > New > Project. Navigate to the Templates list on the left > expand Azure Stream Analytics > Stream Analytics Edge > Azure Stream Analytics Edge Application. Provide a Name, Location, and Solution name for your project and select OK.
After the project gets created, navigate to the Solution Explorer to view the folder hierarchy. From your Visual Studio View menu, select Server Explorer. Right click on Azure > Select Connect to Microsoft Azure Subscription > and then sign in with your Azure account. From the Solution Explorer, expand the Inputs node you should see an input named EdgeInput.json. Double-click to view its settings. Set Source Type to Data Stream. Then set Source to Edge Hub, Event Serialization Format to Json, and Encoding to UTF8. Optionally, you can rename the Input Alias, let’s leave it as is for this example. In case you rename the input alias, use the name you specified when defining the query. Select Save to save the settings. 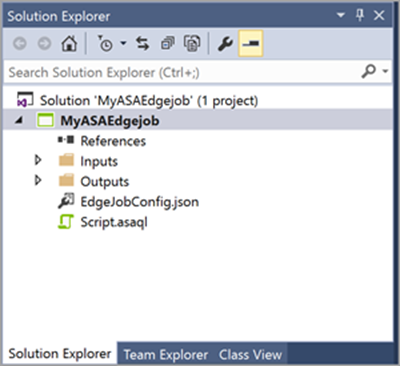 From the Solution Explorer, expand the Outputs node you should see an output named EdgeOutput.json. Double-click to view its settings. Make sure that Sink is set to select Edge Hub > Event Serialization Format set to Json > and Encoding is set to UTF8 > and Format is set to Array. Optionally, you can rename the Output Alias, let’s leave it as is for this example. In case you rename the output alias, use the name you specified when defining the query. Select Save to save the settings. When you create an Edge job in the portal, the compiler will automatically warn you if you are not using a supported operator. To test the query locally, you should upload the sample data. You can get sample data by downloading Registration data from the GitHub repository and save it to your local computer. In the pop-up window > Browse the sample data from your local path > Select Save. A file named local_EdgeInput.json is added automatically to your inputs folder. you can either run it locally or submit to Azure. To test the query > Select Run Locally. You can also sign in to the Azure portal and verify that the job is created. Before you submit the job to Azure, you must connect to your Azure Subscription. Open Server Explorer > right click on Azure > Connect to Microsoft Azure subscription > sign in to your Azure subscription. To submit the job to Azure, navigate to the query editor > select Submit to Azure. A pop-up window opens, where you can choose to update an existing Edge job or create a new one. When you update an existing job, it will replace all the job configuration, in this scenario, you will publish a new job. 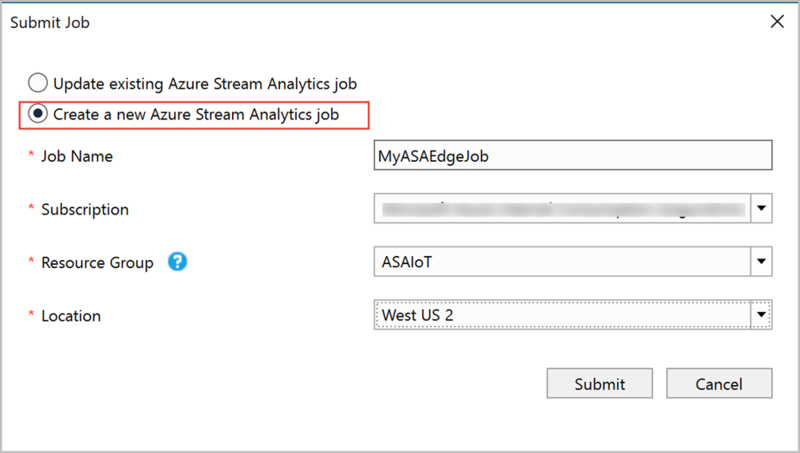 Select Create a New Azure Stream Analytics Job > enter a name for your job something like MyASAEdgeJob > choose the required Subscription, Resource Group, and Location > Select Submit. Now your Stream Analytics Edge job has been created, you can refer to the Run jobs on IoT Edge tutorial to learn how to deploy it to your devices. You can view the status of job and the job diagram from the Server Explorer. From Stream Analytics in Server Explorer, expand the subscription and the resource group where you deployed the Edge job. You can view the MyASAEdgejob with status Created. Expand your job node and double-click on it to open the job view. The job view window provides you with operations such as refreshing the job, deleting the job, and opening the job from Azure portal.